Just found out that Corel sent an email to all registered X3 users offering Corel Painter 2015 for $99. That is a very good deal. I wouldn’t download the trial…just go for the full version at $99.00. Everyone, that is all I know. If you didn’t get an email and you are a registered user, first check your spam folder. Then contact sales. I’m just passing on information I received. Another quick sketch I did with 2015 using a custom particle brush, which I will make available sometime in the future. This entry was posted in 2014 Corel Painter Posts and tagged Corel Painter 2015, Special Pricing. Bookmark the permalink. GREAT flower!! Amazing brush you created and of course the painter ain’t bad either!! Ouch. I do think there are regional differences, so it may be different for Corel Europe. I really don’t know…the information I had was for the Americas. I just upgraded to X3 3 weeks ago. Hope they send out the E-mail to everyone. I’ve been using this since 2006. Len, call them. You may want to wait until tomorrow, but I’m sure they will give you the better pricing…and who knows…since it was just 3 weeks ago, they may be even more generous. I really don’t know…I don’t work for Corel, but I would sure call them. Hi Skip…what is the number to reach Corel that pertains to this aspect of sales. I tried their listed 1-877 number and I ended up talking to Cleverbridge. I will try again tomorrow to contact them about this special. I still have not received an email from them about the special or a reply to my email to them earlier today. I found out that when you call you have to select buy not support. That takes you directly to Corel instead. Thanks Ron for that extra piece of information. Absolutely exquisite Skipper, I will definitely update. Thanks for all the good information. I’ve been missing everyone. My sister has been ill and I have been in Mississippi. Thanks for the updates re: P15 availability and special pricing for registered users of P13. I am a registered user of P13 but did not receive the email (yet). I was curious to learn if you knew of any student discounts available for registered users/students at Digital Art Academy? Thanks for all of the great info and help that you have given in the past. I just updated to Painter 2015. I am thinking how to move all my palettes from X3 to 2015. I guess that I could save/import a Workspace. Is there any other way to bring palette info over? I see that I can save a single palette, but I have many. Custom palettes are tough unless you have 2015 configured exactly as you had X3. You should be able to import a workspace, but I’m hearing folks are having trouble doing that…so I need to do some checking. Give me a little time and I’ll do a video about it. What number do you call? I have not received an email. Thank you so much for this information, Skip!!! I was able to upgrade for $99, but I did have to call. The customer service rep was so nice and helpful…she sent me an email with a link to the checkout cart page with the special pricing. WOOT!! Historically, I’ve been quite frustrated with Corel because even though I register my products (long time user of CorelDraw also) and check all the subscribe boxes I can find, some how I never seem to get all the notices. So I have to go to their site periodically and browse for new info!!! I did not even know Painter 2015 was released!!! So, I guess that worked in my favor this time!!! Again, thank you, Skip for all your efforts in keeping us posted on new developments with Corel and Wacom!! You truly are a blessing!!!! Thanks for the number Marie. It worked. OK, thanks Skip. I have the full version of P12 but I did opt for the educational version of X3 because I am nothing but a retired student hobbyist, so I’ll sign up for your course and download the trial version of P2105. I still have so much to learn about X3, though, that I don’t want to overload my poor old brain and usually a version upgrade comes with a whole new learning curve and complications, not mention glitches . OMGosh Wardie, The Scribble Pen is amazing. I want one. I wonder if it responds to pressure and gives you an expressive line…that would be nice. Hey, this version of Painter is very stable. I think you will be surprised. I’m not sure, but I don’t think you will find there is a whole new learning curve to master. I fired up a trial version of P15 and am quite gobsmacked at the performance improvement. The Watercolor brushes simply whizz along. I think it is amazing, too. Love the extra speed. Yes, that is a sweet deal! And your flowers are lovely! Thank you Rhoda, BTW, I loved you book. Hey Everyone…check out Rhoda Draws book on Amazon.com. Marie, It appears from comments of others, you can contact chat or just call the number listed on the web site. I’ve sent a question into some folks at Corel and hope to find out more answers soon. Hi Skip…. thanks for the info about 2015. I have yet to receive the invite and just called Corel to see if I could purchase it but they won’t sell it at that price unless you receive the invite, so I guess I’m on hold for now. Hey…I’m thinking you just talked to someone who didn’t have all the information. I am pretty sure the offer is good, but I’m hoping to have more information soon…so hold on, more later. Thanks for sharing. I haven’t seen this offer yet. I think you can get it by calling or sending a note to chat. I think more information will be coming soon. I got it for $99. Thanks so much, Skip. The particle brushes are absolutely amazing. I love the new upgrade. It is so stable. My brush seems to just flow smoothly. I think this version of Painter is going to really change how digital art is done. Glad you got the special pricing. It really is a sweet deal. Stable is an understatement. It is so beyond stable. Getting 2015 has been more fun that Christmas morning! There is just so much Corel did to improve Painter. I love the particle brushes. Guess what…I had my first crash in Painter 2015 today. But, I’ll take it…an infrequent crash can happen in any program. I agree, Skip. I managed to crash 2015, but I had a huge file with many layers open and was really pushing things. See you in class! Today I contacted Corel using their “Chat Now” link on the website and was able to get customer service help in less than a minute and recieved my special “shopping cart” with the discount in less than 5 minutes! Customer Service was very nice and helpful. The ‘Chat Now” link is located in the uppper right of Corel’s website. Thanks Donald for the info. It is very helpful. Thanks for the info Skip !!!. Just called the number left by Marie and it worked for me also. They are going to email me the order link. When you call the number, press the option 2 to buy. You should get someone right away…..Thanks Marie !! PS: Skip, do I download the 32 bit or 64 ? ..and is there a big difference?? Thanks ! It depends on your system. Do you have a 64-bit computer? You probably do; it is pretty standard these days. If that is the case then you download the 64-bit version. Folks are telling me that you can use the chat or call the number on the Corel site. I do believe there is more information coming out soon…hang on. Yep… that’s the ticket. Use the chat forum and they’ll send you a link to a pre-prepared invoice with the special price. Enjoy. I posted earlier so I wanted to do a follow up. I did get a full refund from Cleverbridge and the Corel Live Chat did send me a link to a pre-made shopping cart with the $99 special. It did take a few hours of calling and emailing and chatting…but all’s well that ends well. Now to look again at those DAA classes offered by Skip and Jason. The more I look at your red flowers Skip the more enchanting they become. I remember how much fun it was taking your Beginning Brushes class a couple of years ago. Hope your sister is faring well now. Will be chatting tomorrow or waiting for your new information 🙂 Thank you! 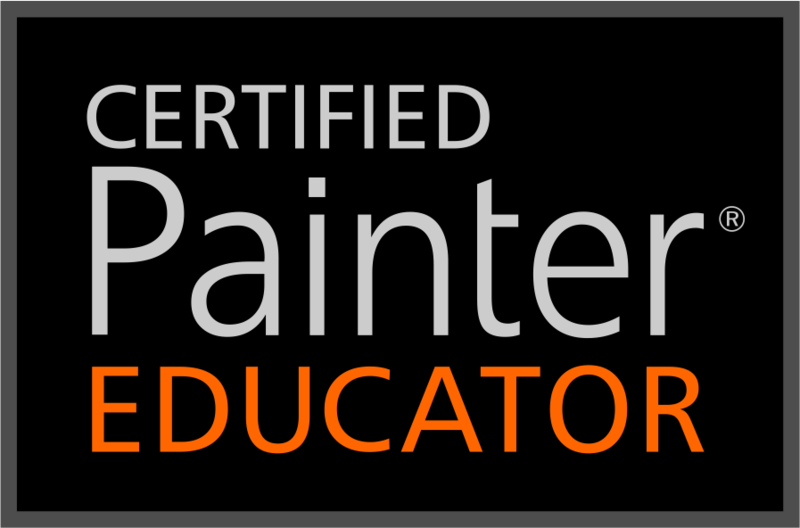 In order to obtain your $99 upgrade to Corel Painter 2015 please call Corel at 1-877-582-6735 ( Mon- Thurs 9 am – 10 pm est & Fridays 9am – 7 pm Est ) and they will take care of you. Thank you for the info, got my special price for the upgrade. 🙂 🙂 Going to install when I can play! I have two Macs, one with 8 GB and one with 16 GB of memory. Both have solid state drives & i7 processor systems. Using a mouse, particle brush drawing is not dramatically delayed. Using Wacom tablet, the 8 GB has large delays drawing with particle brushes while 16 GB system has no delays. I have used the latest Wacom drivers and Macs are OS X 10.9.4. Try turning off the multicore option on the slow particle brushes. You can find it by going to Windows > Brush Control Panels > General. Actually I found it is not obviously related to memory. I tried a Mac Air with 4 GB memory and Painter 2015/ Wacom drawing with particle brushes and Mac Air painting was not slow. So I found out that my retina MAC 2013 with 8 GB memory did not delay when is used its own display even at highest resolution. However I had been using HDMI builtin connection to a 1900×1200 monitor and there is a very large delay. When I tried thunderbolt display adapter for HDMI as well as VGA adapter, I saw the same delay on the Retina MacBook Pro. The older 16 GB MacBook Pro without Retina, does not show a delay even using a VGA thunderbolt adapter. So for now I will just use Retina MacBook Pro’s laptop screen without external monitor connection until this issue is resolved. Thanks for the follow-up. Did you try my suggestion of turning off the multicore function in the General Brush control panel? Yes I did first try turning on and off multicore in the General Brush control panel and did not see any difference in performance on 8 GB and 16 GB MACs. Shoot, I have heard that helps in some circumstances.